He formed City City City, an improvisational and mostly instrumental band, and recorded two albums with them before signing to Australian label Dot Dash Recordings and releasing his debut solo album, Jokes and Trials, in July 2006. It drew influences from Paul Kelly, Nick Drake and Syd Barrett. During this time he performed solo, using loops to augment his electric guitar playing. Collette joined Bill Callahan and The National for a series of gigs in Australia and also toured Europe and Britain with harpist Joanna Newsom and indie pop band Camera Obscura. Dot Dash Recordings is a collaboration between the two companies - Remote Control Records which provides publicity, marketing and label management while Inertia Distribution looks after distribution and sales. Dot Dash Recordings was set up by in mid 2004 as a new label for Australian artists. Paul Maurice Kelly is an Australian rock music singer-songwriter, guitarist, and harmonica player. He has performed solo, and has led numerous groups, including the Dots, the Coloured Girls, and the Messengers. He has worked with other artists and groups, including associated projects Professor Ratbaggy and Stardust Five. Kelly's music style has ranged from bluegrass to studio-oriented dub reggae, but his core output straddles folk, rock, and country. His lyrics capture the vastness of the culture and landscape of Australia by chronicling life about him for over 30 years. David Fricke from Rolling Stone calls Kelly "one of the finest songwriters I have ever heard, Australian or otherwise." Kelly has said, "Song writing is mysterious to me. I still feel like a total beginner. I don't feel like I have got it nailed yet". |website = www.rrr.org.au }} 3RRR is an Australian community radio station, based in Melbourne. Damon Albarn is an English musician, best known as the lead singer of the British rock band Blur as well as the co-founder, lead vocalist, instrumentalist, and principal songwriter of the virtual band Gorillaz. Herbert Jansch was a Scottish folk musician and founding member of the band Pentangle. He was born in Glasgow and came to prominence in London in the 1960s, as an acoustic guitarist, as well as a singer-songwriter. He recorded at least 25 albums and toured extensively from the 1960s to the 21st century. Joel Hamilton is a Brooklyn-based record producer, engineer and musician. Joel performs as a musician with the band Book of Knots. He is also a producer and engineer at Studio G in Brooklyn, New York. Philippe Petit is a French high-wire artist who gained fame for his high-wire walk between the Twin Towers of the World Trade Center in New York City, on the morning of August 7, 1974 as well as his high wire walk between the towers of Notre Dame cathedral in Paris, 1971. For his unauthorized feat 400 metres above the ground – which he referred to as "le coup" – he rigged a 200-kilogram (440-pound) cable and used a custom-made 8-metre (30-foot) long, 25-kilogram (55-pound) balancing pole. He performed for 45 minutes, making eight passes along the wire. The following week, he celebrated his 25th birthday. All charges were dismissed in exchange for him doing a performance in Central Park for children. 2 is the second album by Australian folk-rock band Ned Collette + Wirewalker, released in 2012. Fire Records is a British independent record label, based in London, England. The label was founded by music journalist Johnny Waller and Clive Solomon in 1985 and released early records from Pulp, Teenage Fanclub, Spacemen 3, Blue Aeroplanes, Lives of Angels and others. In the early 1990s, the label was home to Neutral Milk Hotel, The Lemonheads, Built to Spill, Urge Overkill and others. Gemma Ray is a British songwriter, guitarist, singer, film composer and producer. Brian Timothy "Tim" Finn is a New Zealand singer and musician. His musical career includes forming 1970s and 1980s New Zealand rock group Split Enz, a number of solo albums, temporary membership in his brother Neil's band Crowded House and joint efforts with Neil Finn as the Finn Brothers. MY DISCO is an Australian band formed in 2003. Michael John Harvey is an Australian musician, singer-songwriter, composer, arranger and record producer. A multi-instrumentalist, he is best known for his long-term collaborations with Nick Cave, with whom he formed the Boys Next Door, the Birthday Party and Nick Cave and the Bad Seeds. Crime & the City Solution are an Australian rock music band, which formed in late 1977 by singer-songwriter and mainstay, Simon Bonney. They disbanded in 1979 with bootleg recordings and demos that are extremely rare. In late 1983, Bonney traveled to London. Two years later he formed another version of the group there with members of the recently disbanded The Birthday Party; later they transferred to Berlin, where they issued four albums – Room of Lights (1986), Shine (1988), The Bride Ship (1989) and Paradise Discotheque (1990) – before disbanding again in 1991. In 2012 Bonney reformed the band in Detroit with two veterans of the Berlin era and a handful of new members. Simon Philip Bonney is an Australian country rock musician. He formed Crime & the City Solution in late 1977 as a post punk group and an outlet for his song writing. The band has had different line-ups throughout their history, with Bonney as the only mainstay. Bronwyn Adams joined in 1986 on violin and backing vocals – the pair later married. 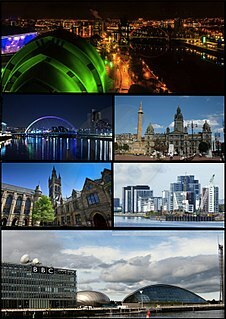 Incarnations of Crime & the City Solution have existed in Sydney, Melbourne, London, Berlin and Detroit. When Crime & the City Solution split up in the early 1990s Bonney and Adams relocated to the United States where he released two solo albums, Forever (1992) and Everyman (1996). Crime & the City Solution reformed in 2012. Kynan Robinson is an Australian trombonist and composer. He is most commonly associated with jazz but also plays other styles. Deloris were a 4 piece indie rock band from Melbourne, Australia, who were active from 1999 until 2008. Pieter Alan Bourke is an Australian composer, keyboardist, percussionist and audio engineer. From 1995 he has recorded several projects with Dead Can Dance founder Lisa Gerrard, and was a touring member of Dead Can Dance's 1996 Spiritchaser Tour. On 14 April 1998 Bourke and Gerrard issued a world music album, Duality. From 1993 he also collaborated with industrial musician, David Thrussell, first as part of the latter's band Snog, then together as the ambient duo, Soma. In 2001, he formed a dub reggae outfit, Secret Masters, with Brian Westbrook. Bourke and Gerrard have received two shared Golden Globe nominations for 'Best Original Score', in 2000 for The Insider (1999), and in 2002 for Ali (2001). The Basics are an Australian band, formed by Wally De Backer and Kris Schroeder in 2002, later joined by Tim Heath. Their style has been described as anything from 'indie-pop' to 'rock'n'roll', though their records show they span a wide range of genres, including reggae, pop-rock, folk, country, and electro-pop. They are "recognised as one of Australia's hardest-working bands". Joe McKee is a London-born composer and sound artist. He was raised in the Darling Ranges of Western Australia from the age of five. Joe Matera is an Australian singer-songwriter, guitarist and rock journalist. In addition to a solo career, Matera is the guitarist in the Sweden-based rock band Rough Rockers, and was formerly the lead guitarist of Australian famous pop rock band Geisha between 2007 and 2010. Before joining Geisha, Matera was the lead guitarist of classic rock band Double Vision, from 2003 to 2008. He's currently working as a solo artist, releasing solo instrumental albums and contributing guitar on various recordings around the world. Eden is a Dark Wave band that was formed in Melbourne, Australia, in 1987, by Sean Bowley, Pieter Bourke and Ross Healy. Teeth & Tongue is the music project of Melbourne-based, New Zealand-born songwriter and musician Jess Cornelius. The moniker is a stage name for Cornelius's solo performances and also refers to her collaborative work with various band members. Networking in Purgatory is the third album by Australian folk-rock band Ned Collette + Wirewalker, released in 2014. Over the Stones, Under the Stars is the debut album by Australian folk-rock band Ned Collette + Wirewalker, released in 2009. 1 2 3 4 5 Mark Mordue, "Berlin Dreaming" The Australian , 23 October 2010. ↑ Dan Silkstone, Future Suture review, The Age, 26 October 2007. ↑ Noel Mengel, "Anything But Boring", The Courier-Mail, 3 December 2009. Four out of five stars. ↑ Kathy McCabe, The Daily Telegraph, 24 October 2009. ↑ Craig Mathieson, "Down to the wire, from here to Berlin", The Age, 27 November 2009. ↑ Kate Hennessy, The Sydney Morning Herald, 26 May 2012, four of five stars. ↑ Graeme Hammond, Sunday Herald Sun, 27 May 2012, 3½ out of five stars. ↑ Bella Todd, Time Out London, 1 August 2012, 4 out of five stars.